In 1887, Stevens Arms (The J. Stevens Arms & Tool Company) took the case of the .22 Long rimfire round and added the 40 grain bullet of the .22 Extra Long from about 1880: the .22 Long Rifle was born. Production of the .22 Extra Long ended around 1935. Today, about half of all cartridges sold in the United States, 5 billion, are estimated to be .22 Long Rifle rounds. The .22 is often excellent at penetration. With a 794 fps impact velocity from a 3.4 inch barrel, CCI Velocitor ammo penetrated 15.5 inches into 10% ballistic gelatin in Brass Fetcher testing. Expansion, however, was only .038 inch. While a .223 inch hole is a comparatively large hole to a rat or a rabbit, reliable expansion is often not reliable to essentially non-existent. Over the years there have been several do it yourself kits to make large hollow points out of standard lead round nosed ammo: drilling holes in loaded rounds one at a time. Federal's new Hunter Match 1200 fps 40 grain rounds take care of the expansion issue right out of the box: promising reliable expansion out to 100 yards on small game out to 100 yards out of a rifle, and good expansion out of a pistol or revolver at similar, lower impact velocities. Federal is vague about exactly what can be expected, saying that these rounds are “tuned for optimum penetration and expansion out to 100 yards.” Whatever “optimum” might be, I have no idea, but it sounds good which is of course the whole idea. 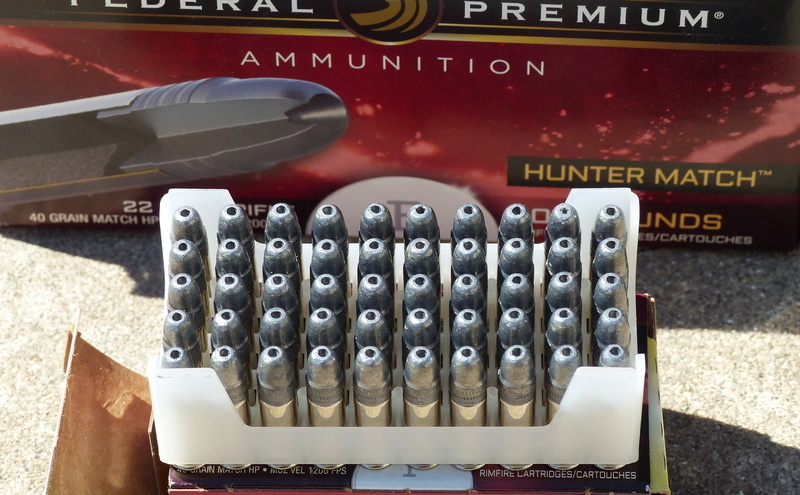 Nevertheless, these are truly hot and nasty looking hollow points that every small game and pest control enthusiast is going to want to try out of their own .22 rifles and pistols and judge the results for themselves.